A few weeks ago, the British music press freaked out when they found a clip of one ‘Maureen Tucker’ being interviewed at a Tea Party rally in Georgia. 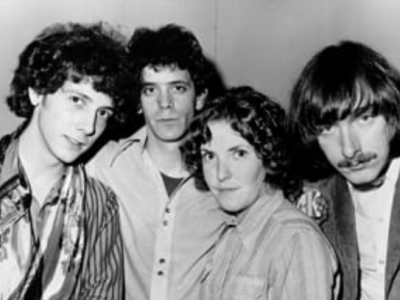 Could this be the same Moe Tucker who played drums alongside Lou Reed and John Cale in the legendary 1960s rock band the Velvet Underground? Was the backbeat behind ‘All Tomorrow’s Parties’ now railing against the Democratic Party with a bunch of Okie from Muskogees? The answer was yes. It’s the story of unexpected political evolution with a generational twist – an icon of alternative rock turns into a conservative populist, a tale for our times. The notoriously understated Moe Tucker now lives in a small Georgia town about hour outside Atlanta, though her New York accent endures. She’s a suburban warrior, the woman next door with grown up kids and a rock n’ roll past. She was at first reluctant to talk when I hunted down her number. But her journey might help humanize the Tea Party for members of Alternative Nation – or it might just add insult to the injury that looks like its coming on Election Day. It was the first time she’d ever voted Republican. The fact Maureen Tucker’s comments sound so familiar to any one with friends or family who identify with the Tea Party says a lot about the roots of their anger. It’s not just the 60s crew-cut crowd of traditionalists – there’s something bigger going on, rooted in frustration with self-dealing politicians and their unsustainable spending. She recounted with special frustration watching a recent Fox News interview where Chris Wallace asked GOP Senate nominee Carly Fiorina what specifically she would cut to balance the budget. “She refused to answer the question seven times and then accused him of asking a purely political question,” she said. This entry was posted in Columns, Featured Columns and tagged Independent Voters, The Daily Beast. Bookmark the permalink.